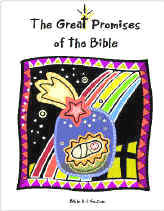 The seven great promises of the Bible covered in this series are the big picture covenant promises of God's redemptive history, beginning with the promises God made in the Garden of Eden and extending through to the promise of a new heaven and a new earth for God's people. Some of these great promises are conditional; however most you will discover, reflect the faithfulness of God to redeem his people despite their sinful waywardness. This series presents a broad brush stroke of God's Word from Genesis through Revelation, which includes the Garden Promises, Rainbow Promise, Promise of a Holy People, Kingly Promises, Promise of a New Heart, Promise of a New Temple, and the Promise of a New Heaven & Earth. Download a free sample from the series. 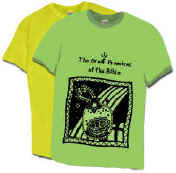 Includes 14 sessions for kindergarten - 5th grade, with 9 crafts (6 crafts - 3 food devotions), 8 games, and memory verses with memory verse bracelet patterns. If you use both the craft and game for each session, it will take seven, two hour sessions to complete this series. However, if you split each lesson into two sessions (recommended), whereby you present the lesson, memory verse, and craft in the first session and the game with lesson review, and memory recitation in the next session, it will take fourteen, one hour sessions to complete this series. Includes a black & white Promises design that can be printed on T-shirts, flyers and posters!